Hair transplant is a procedure that will help you cover up your bald patches and restore the hair volume on your scalp. Once you decide to get a hair transplant done, your work does not end there. You would have to choose the right hair transplant clinic and also agree upon the course of the treatment and the results that can be achieved through the surgery. This is done after the hair transplant interview with the hair restoration specialist. It will help if you ask the right questions during the course of this interview so that you can articulate your need and expectations correctly to the specialist. To help you with it, here is our guide about the hair restoration questions to ask before a hair transplant. 1. Do I really need a surgical hair transplant? There are many situations in which hair growth can be initiated with the help of non-surgical methods like topical treatments or low level laser therapy. Find out if you are a candidate for such a treatment so that surgery can be avoided. In cases where the hair follicles are not dead, such treatments are known to help. 2. If I need surgery, then what method will be used for it? If surgery is what can correct the baldness, then find out from the specialist as to what method of hair transplant will be used. Of late, most surgeons use grafting since it produces natural results. 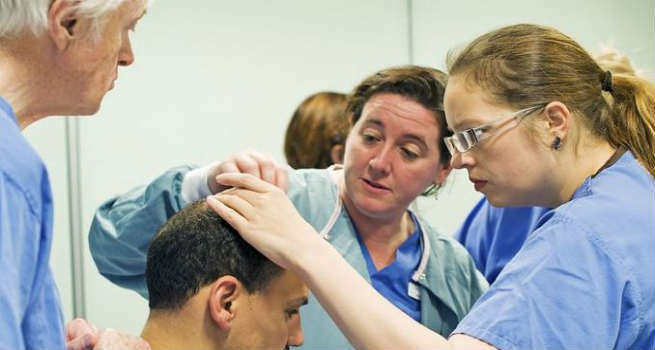 According to the area of the bald patch that needs to be covered, the surgeon will advice you to take up follicular unit extraction or follicular unit transplant. 3. How much does the procedure cost? Depending on the amount of donor hair you have and the amount of bald area to be covered, the cost will vary. If you have plenty of donor hair, then the surgeon will harvest more follicles in order to obtain natural looking results. The cost of the surgery will depend on the number of follicles harvested. Find out upfront as to how many follicles will be harvested and what the cost of the surgery will be. 4. Ask for before and after photos of the patients treated by the surgeon. Do not agree for the surgery until you have seen and are satisfied with at least 10 before and after pictures of the patients treated by the surgeon. Normally, they would be taken against the backdrop of the clinic in order to prove their authenticity. Look for any possibility of digital alteration. The pictures should be well lit and natural looking. 5. Ask if you could get the contact information of clients who are willing to talk about their experience. Some surgeons give you the contact details of patients who have been treated in the same clinic so that you can get first hand information about their experience. Ask if you can get those details. 6. How long will the procedure take? How many sittings would you need? Find out how long the transplant procedure should take since you would have to adjust your calender accordingly. Sometimes you might need more than a couple of sittings if the area of the scalp that needs coverage is large. Since you will have bandages around the scalp and your movement is restricted, find out about your recovery time so that you can plan your activities. If the surgery is performed correctly and you do not have any complications, you should be able to recover from the surgical wounds in the time predicted by the surgeon. 8. Would there be a need to also use hair loss medication after the surgery? Some surgeons prescribe topical medication or supplements in order to combat hair loss even after surgery. Find out if there would be a need for it so that you can plan your expenses. 9. Ideally, when would you observe the newly planted hair falling off and when can you expect new growth? It is perfectly normal for the newly transplanted hair to fall before it can start growing again. However, you need to find out when it will start growing back again so that you can track the progress correctly. 10. Would you need any future transplants? If the degree of your hair fall is high, then the surgeon can gauge if you will need more transplants in future. He could also prescribe medication to control further hair loss. Once you are completely satisfied with the responses to these hair restoration questions, you can go ahead with the surgery.